Hello and welcome back to Day #4 of Winnie & Walter’s 2nd Belated Birthday Bash! This is last day of sharing sneak peeks. Today we are premiering LS Exclusives: So Tweet with Evelin T Designs stamp set, Flawless Diamond Cutaways, Flawless Heart Cutaways, Winnie’s Sparkly Shaker Selection and Walter’s Sparkly Shaker Selection Both Winnie’s and Walter’s Sparkly Sequins collection are brought to you by Little Things By Lucy. Very pretty and soft shaker collections. I have a card to share using LS Exclusive: So Tweet with Evelin T Designs stamp set. I LOVE LOVE the birds in this set. Adorbs! 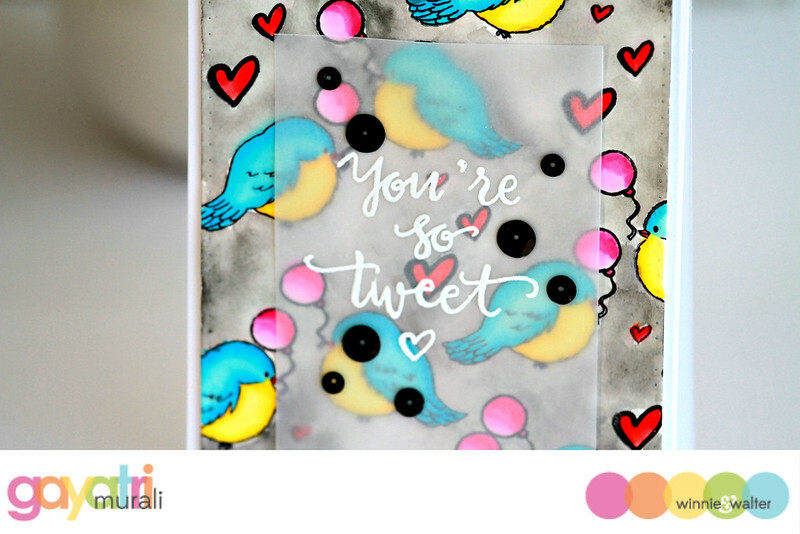 I started with stamping the birds with balloons paired together, then filling up with hearts. Then I coloured the images with Zig Clean Brush watercolour markers. Filled the background with watercolour. Love the bright colours and contrast on the watercoloured panel. I die cut the panel using the largest rectangle die from Essentials: Katherine Cutaway. Since the background is bright and busy, I decided to use a vellum layer for the sentiment. I white heat embossed the sentiment on the vellum layer and adhered on top of the watercoloured panel. Finally embellished with some black sequins from Little Things by Lucy. I brought the black colour from the watercoloured panel to the front using the black sequins. Do you like to win these new goodies? Then head over to Winnie & Walter’s Blog for more details to how enter to win these goodies. There are many gorgeous inspirations from designers at Winnie & Walter’s Blog. Make sure to stop by for Day #4 premiere tomorrow. I would never think to say i loved a blackish water color background, but it really works, like you say the black sequins finish it off!! 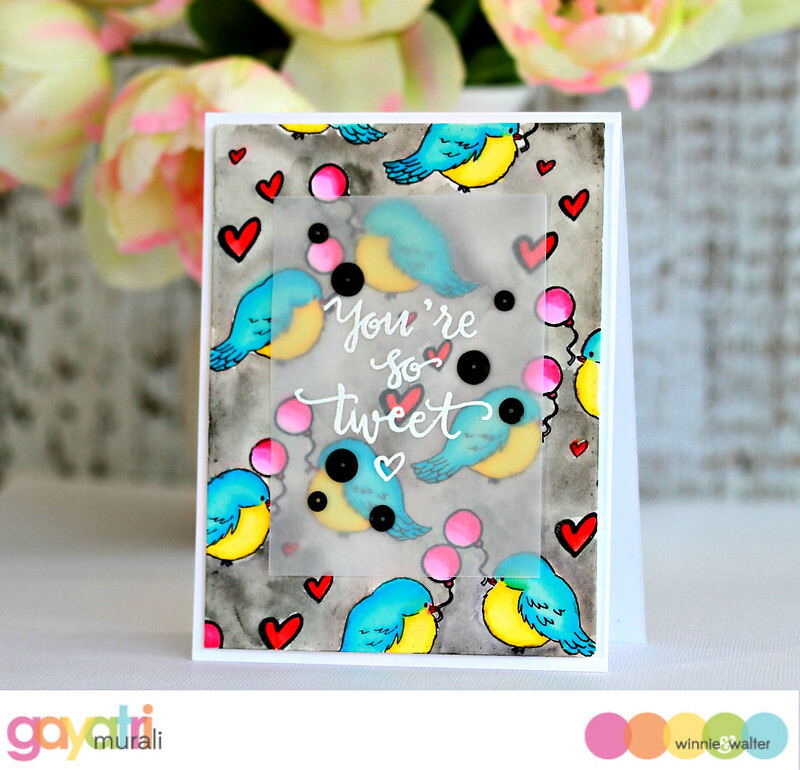 Make your bright birds pop! WOW Gayatri! You did a FANTASTIC job on your card! Could this have been ANY sweeter??? I think not! Just perfect, I love this. (Shay could NOT have found a better group of ladies to highlight this release. You girls are ROCKING IT! Such a cute colorful card.